It’s extraordinary to note that this is the 90th. edition of the Club’s monthly newsletter! Over 120 copies are sent out electronically each month, with more going out in the post to those who have no internet facility. The newsletter also appears on our Facebook page and in the Club’s website, so the actual readership is far, far greater. 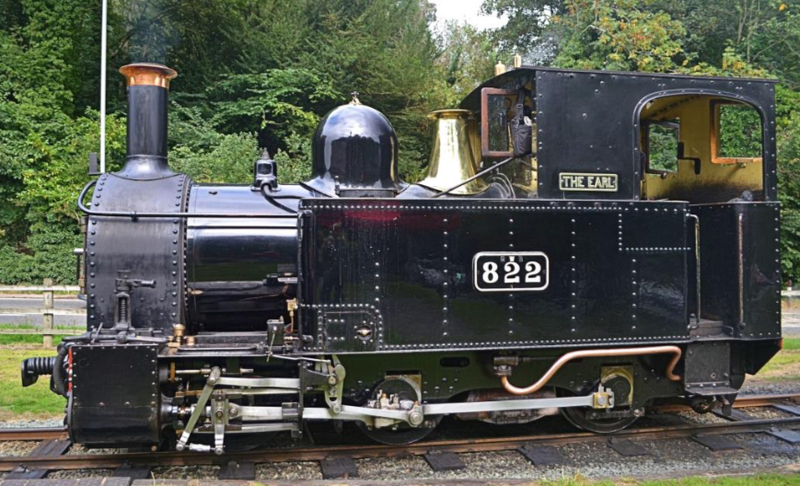 The newsletter has resulted in new members being attracted to the Club, enquiries from afar about purchasing our commissioned wagons, requests to manage stock- sales and even some seeking permission to use our photographs and reviews. Judgement Day for next year’s competition will be Thursday the 28th. March 2019. As mentioned in the August newsletter, the 2018 competition was the best ever, both in terms of numbers and quality. Next year, we are hoping to surpass 2018 and it is time now to start thinking about what you will be submitting. The rules for next year can be found here: they are slightly amended to clarify one or two issues but note that there will be cash prizes again! If you have any uncertainties with regard to the rules of engagement, please speak to me at the Club [but far better sooner than later!]. A welcome back to Gwyn Jones who visited the Club the other Thursday after a long post-op recovery. We look forward to seeing you again, soon [and I think that Scott Rhodes may have you down for raffle tickets again at the show!]. Best wishes too to Alan Cosker, Randall Morris and David Lane who have left the Club although I understand that David may only be a temporary absentee. I’ll continue to send you all newsletters to keep you up to date with club developments and, of course, you are welcome to visit again at any time. Supermarkets already have decorations on sale and it’s time for us to consider our Christmas Dinner. John Allnutt has once again booked Morriston Golf Club for the evening of the 15th. December. A notice inviting expressions of interest will soon be put up on the Club’s notice board, together with the three-course menu. Please sign promptly if you are interested. Once again, the Club will subsidise members and the cost will be £15 for members and £18.50 for guests. We had our ‘do’ at the same venue last year and it was excellent. At the time of writing, the show is just 21 days away! In spite of some recent nail-biting caused by two exhibition layouts pulling out at very short notice, we have been able to recruit replacements [one, an O gauge layout, from as far away as Morpeth] and we will have at least 20 layouts [and maybe more] exhibiting over the weekend. Help is still required however and if any members are able to take fliers and posters for distribution in shops, surgeries, libraries, etc. across Swansea, please let Scott Rhodes know urgently. For the show to be a success we need the footfall and the key to that is effective advertising. Any who have yet to come forward to help with marshalling or the Friday set-up please make yourselves known also. Thanks. Finally, we also need donations for the raffle. Bottles of wine are always nice, but non- alcoholic prizes are needed also! If any member can help with a donation it would be very much appreciated. Next year’s show will be held on the 21st and 22nd of September 2019. I am hoping to arrange a smallish sale later in October, after the show has passed. A mixed bag which will include some interesting post-war Dinky Toys as well as collections of white-metal loco bodies and older weathered freight stock alongside more recent Hornby resin Skaledale buildings. I don’t have much by way of further details yet but will update members through the October newsletter [or by e-mail if sooner]. We have also been given a largish amount of Trix Twin 3-rail track to dispose of, both the original Bakelite-based rails and the later fibre-sleepered variety, all in good condition. This is pretty niche stuff I accept, but if anyone wishes to purchase some, or knows of anyone else who might, please let me know at the Club. 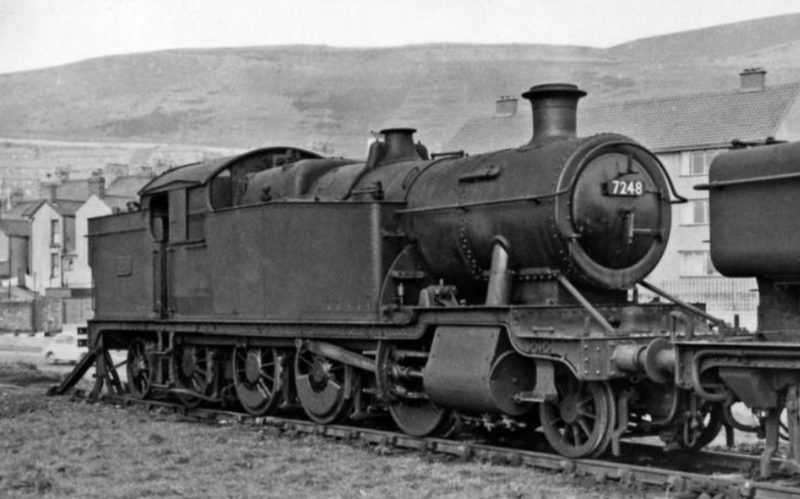 7248, an ex-GWR 2-8-2 tank, in the north side sidings of Swansea East Dock, circa 1955. Kilvey Hill is in the background. © Ben Brookbank and used under Creative Commons licence. Many thanks to Steve G who has taken over responsibility for managing the ordering of Club clothing. Alongside the usual aprons, polo shirts and sweat shirts, etc., Steve can now supply burgundy-coloured baseball-type caps too, with or without your name embroidered on them! If you want to order / re-order Club clothing, just ask Steve for a form, fill it out and return it to him when you next see him at the Club. The fire alarms within the club have been confirmed as working and a Committee member is currently auditing all of SRMG’s fire extinguishers to assess the appropriateness of their siting and type, and also the dates by which thy will need to have been tested. The external fire escape has had further remedial repairs and I have been told that it is now fit for purpose. Should members hear a fire alarm at any time, they must assume that it is genuine and not ignore it. If our Fire Marshalls are present [identified by their tabards], their directions must be followed immediately and members must leave the building without delay by the nearest exit: the main stairs or the fire exit situated beyond the club’s workshop. No-one should stop to collect anything to take with them but should go straight to the assembly point outside the main gate. Any member who is in the Club alone when a fire alarm is sounded should follow the same procedure as outlined above. More formal notice will be issued in due course. Don’t forget! Our show will take place on the weekend of the 6th & 7th. October 2018. Full details are here.